We’ve been in business for more than 35 years. The reason? 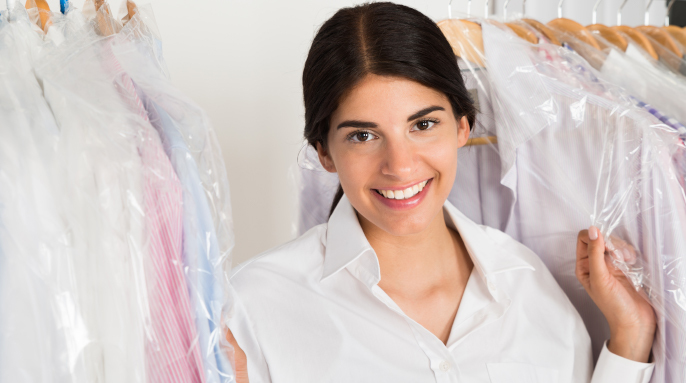 We are working for you every day, to make Selective Cleaners your #1 choice for dry cleaning. Your suits, skirts, dresses, coats, sweaters, and other clothing receive the very best at Selective Cleaners. We also provide exceptional dry cleaning services for special items such as wedding gowns, leather, suede and furs, household furnishings and even items that have been damaged by mold, smoke or water. Our ‘fluff and fold’ service includes laundering your everyday clothes as well as household items such as blankets, comforters, pillows and rugs.We take pride in what we do, working to give you quality care for your possessions. Elegant Laundry Service. Why do the family shirts when Selective Cleaners can do them for you? Our quality is impeccable and our service unbeatable. Our state-of-the art equipment make shirts look like new. No marks, no creases, cleaned and gently pressed. We even replace buttons FREE! Expert Alterations. We have over 30 years of experience altering, repairing and adjusting clothing for men, women, children, seniors and even infants. If you have something that doesn’t fit quite right, bring it in and we’ll make sure you leave with a prefect fit. We guarantee our expert alteration services at reasonable prices. Same Day Service. So much dry-cleaning, so little time. That’s why Selective Cleaners makes it easy to get your order in and out on the same day. Drop off your dry-cleaning and shirts by 11 am, and we’ll have them crisp and ready by 5 pm, guaranteed, or it´s FREE! Monday through Saturday. Just swing by on your way home from work. Free Express Bag. Want to save time? A Selective Cleaners Express Bag service is the bed solution. Just ask for a free express bag at the counter of your nearest store. Stuff it and drop it off. We’ll take care of the rest. There’s no waiting and no hassles. Become a VIP. Plus, why wait to pay when picking up your order? Sign up for Selective Cleaners exclusive V.I.P. Express Service. We keep your credit card number on file; you simply pick up your order and go.